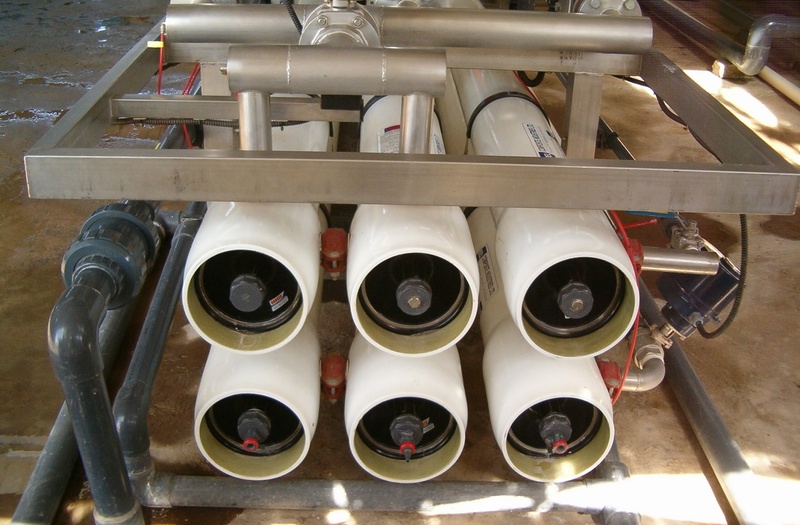 Reverse osmosis (RO) is a membrane filtration process. It removes dissolved salts, as well as viruses and bacteria. The particle size removed by reverse osmosis is approximately 0.0001 to 0.001 micron. Applications in the industry, such as, the pharmaceutical industry, semi-conductors industry and boiler feed water. In reverse osmosis, the water is pushed through a semi-permeable membrane, where a pressure greater than the osmotic pressure, is applied to the higher concentrated solution. Semipermeable membranes allow only certain ions or ion to pass through. And therefore, in the reverse osmosis process, water pass through the membranes, leaving the salts behind. The required pressure depends on the salt concentration in the inlet water. Unlike in most filtration processes, in reverse osmosis there are three streams – Feed, permeate and concentrate (or reject water). The feed is the inlet water. This water is separated to permeate – purified water and concentrate. The concentrate refers to the water that does not pass through the membrane and contain the rejected salts. Isotropic membranes are uniform in their composition and physical structure, while anisotropic membranes are not uniform throughout their cross section. They usually consist of different layers. The most common types of reverse osmosis membranes are cellulose acetate membranes (CA) and thin film composite membranes (TFC). Cellulose acetate membranes were the first commercial RO membranes. They are more sensitive to biological fouling than thin film composite membranes, however they are also more resistant to chlorine. Cellulose acetate membranes are stable at a pH range of 4-8. Thin film composite membranes consist of three layers – a thin polyamide layer, a polysulfone layer and a non-woven polyester support, where the thin polysulfone layer is the one that provides the salt rejection. Thin film composite membranes have a higher rejection of salts, compared to cellulose acetate membranes. However, they are very sensitive to chlorine, which degrades the polymer matrix and might results in drastic decrease in the membrane salt rejection. Thin film composite membranes are stable over a wide range of pH and higher temperatures. Each module has its own benefits and is adequate for specific uses. Typically, reverse osmosis membranes are packed in a spiral-wound module or hollow fiber. Hollow fiber – many long, thin, spaghetti-like membrane fibers are packed together. Each fiber has a diameter of around 100 microns (like human hair). This structure provides a very high specific surface area. Spiral wound – Several flat sheet membranes are wrapped around a central permeate tube, which collects the permeate. The membranes are separated by spacers, where the distance between the membranes is about 0.25 to 1.0 mm. The modules are usually connected in series inside a pressure vessel.